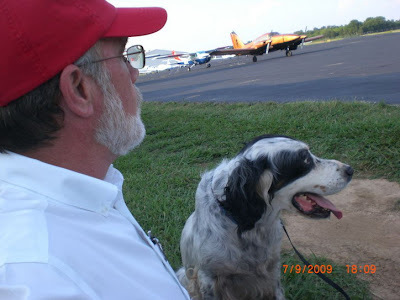 Cancer won't stop a Bird dog! When we first tested her in the fall--she was not scent pointing--as she was so sick from Ehrlichia and Rocky Mountain spotted fever. Once the diseases get under control--the brain damage subsides and their (click here to learn more about this) olfacotory senses return. 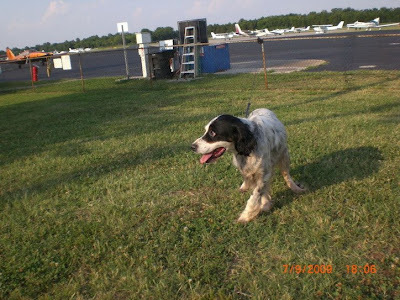 I have no doubt so many hunting dogs are abandonded because they are sick with tick borne illnesses and stop hunting because they are too ill. Opehlia is still fighting both of hers and post surgery--her RMSF infection got worse...But THIS was a good day. She has been back on her antibiotics the past few days. 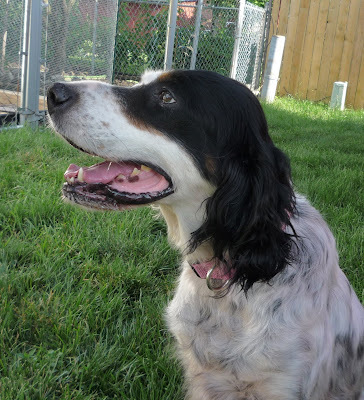 Ophelia is a beautiful Tri-colored American Field Bred English Setter. 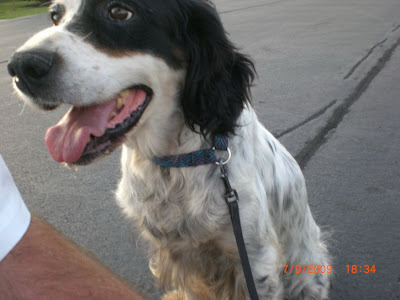 She was in terrible shape in a shelter in Chattanooga, TN when her need of rescue crossed my email back in June. 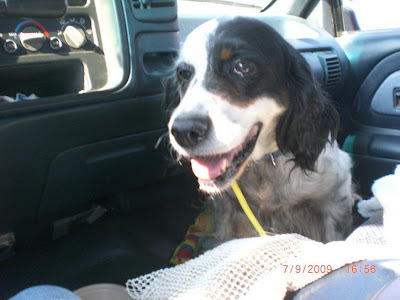 Once we secured a rescue, we had her rushed to a vet and it was discovered that she was fighting a terrible case of Ehrlichia and Rocky Mountain spotted fever. Had we not caught this--Ophelia's health would have declined and eventually she would have died a slow painful death. Vetting bills are nearly $700 so far. Recently we were told Miss Ophelia also needs a mastectomy due to some suspicious masses in her mammaries. A Mastectomy can run over $1,000 and with complications, maybe more. Any help we can get to off set her bills would be most appreciated. Hi there! 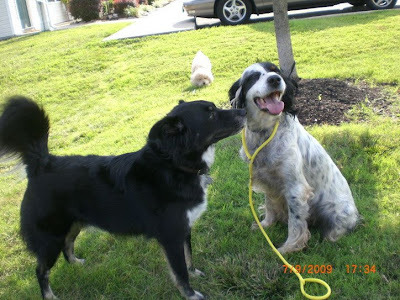 Read what my foster family has to say about me. I know I'm the perfect one for your family. needs someone who will spend time with her. I wouldn't doubt she is looking for a best friend. She does run in the backyard several times. Our Rudy is trying to play with her. She is eating everything we give her, and my wife has commented that she looks like she has gained some weight. She is good with other people, dogs, and kids. The last two nights, both dogs have slept on the back porch (locked into screened in area), she in her kennel, which we've left the door open and Rudy on pillow next to her kennel. They go to sleep there and when I get up in the morning, they are still in their respective spots. I suspect shes had some potty training sometime in her past, as we haven't had any issues yet. Now, after reading all of this good stuff on me, don't you agree, I belong in your family? We let Ophelia do as she liked while we were working in the backyard today, and noticed some interesting things. First, she is certainly birdy. She chased a couple of robins back into the trees, also pointed a chipmunk in the next door neighbors yard. She has a petite bite, when offered treats, she does not lunge, but takes only the treat portion from your hand. We believe she may have belonged to a man, as she definitely wags her tail more when I am around than my wife. (She even gave me a couple of kisses already, so I think someone must have spent some time with her in the past). She is already coming to me, when I call her (except when she was pointing the chipmunk...but thats a good sign for a dog of her genetics). She is a good eater. She enjoyed her brushing and really likes her belly rubbed. We haven't heard her bark yet, and each of our neighbors dogs have certainly barked at her. More updates later. Again, thanks to everyone who helped this girl. Tell me again, I'm riding in What! Hey, I hear you're flying. How do you do that? I don't know about this. I'm a little nervous. I just want to tell 'ya thanks for helping me, John. It means a lot to me. 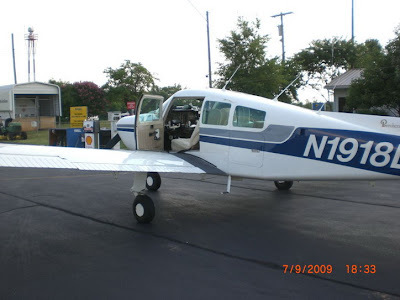 Well, I guess this is my ride. Will let you know how it all turns out. Later, Ophelia.